It’s heartbreaking to hear the individual stories of those who were discriminated against. It’s even worse to consider the thousands of others whose stories aren’t told. Legalized marijuana is going the way of all agricultural commodities in the United States, and that shouldn't be a surprise. A really interesting analysis by 538 reveals that the price of pot has dropped for grower and dope fiend alike, and with big money at stake -- $6.7 billion this past year and $20 billion the dream for 2021 -- big money is very interested. Jeremy has some great insight in looking at marijuana as a simple staple crop. 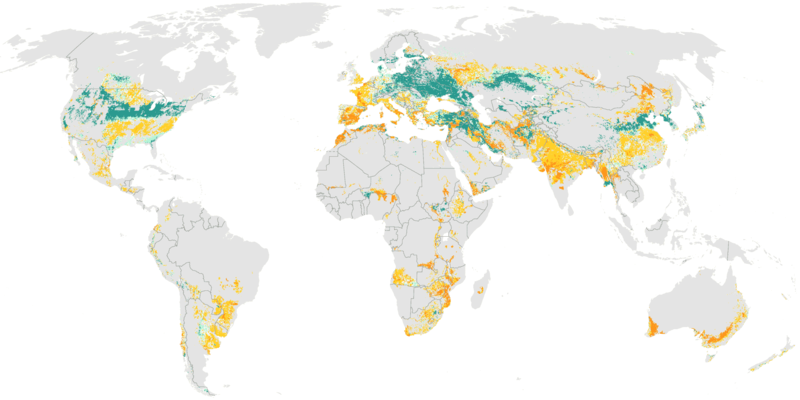 It would be interesting to view this as a simple agriculture problem and compare the economics of it for the first several years to other crops like soybean and sorghum. I’m relatively sure of where things will end up, I’m just curious how they differ until things reach scale. This is a particularly interesting economics problem because it provides an experiment that isn’t an easy one to recreate at these scales for how often does a mass consumable crop get discovered? The best advice for a good diet I’ve ever heard. It’s a maxim devised by Colin Tudge, long before anything similar you may have heard from more recent writers. Tudge, more than anyone else I know, has consistently championed the idea that meat ought to be seen in a supporting role, rather than as the main attraction, a garnish, if you will. Tudge has been thinking and writing about agriculture and food systems for a long time, and we’ve been friends for a long time too. In fact, it’s fair to say that knowing Colin has influenced my own thoughts about food and farming quite a bit. As far as Colin is concerned, we’ve been going about farming in completely the wrong way for the past 100 years or so. Instead of asking how can we grow more food, more cheaply, he thinks we should focus on what we need – good, wholesome food that doesn’t destroy the earth – and then ask how we can provide that for everybody. He’s expanded and built on those ideas in many books since Future Cook (Future Food in the US), which contained that pithy dietary advice and which was published in 1980. And rather than reform or revolution, neither of which will do the job he thinks needs to be done, he advocates for a renaissance in real farming. 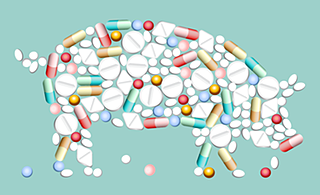 Tackling the problem of antibiotic resistance at (one) source In the past year or so there has been a slew of high-level meetings pointing to antibiotic resistance as a growing threat to human well-being. But then, resistance was always an inevitable, Darwinian consequence of antibiotic use. Well before penicillin was widely available, Ernst Chain, who went on to win a Nobel Prize for his work on penicillin, noted that some bacteria were capable of neutralising the antibiotic. What is new about the recent pronouncements and decisions is that the use of antibiotics in agriculture is being recognised, somewhat belatedly, as a major source of resistance. Antibiotic manufacturers and the animal health industry have, since the start, done everything they can to deny that. Indeed, the history of efforts to regulate the use of antibiotics in agriculture reveals a pretty sordid approach to public health. But while it can be hard to prove the connection between agriculture and a specific case of antibiotic resistance, a look at hundreds of recent academic studies showed that almost three quarters of them did demonstrate a conclusive link. Antibiotic resistance – whether it originates with agriculture or inappropriate medical use – takes us back almost 100 years, when infectious diseases we now consider trivial could, and did, kill. It reduces the effectiveness of other procedures too, such as surgery and chemotherapy, by making it more likely that a subsequent infection will wreck the patient’s prospects. So it imposes huge costs on society as a whole. Maybe society as a whole needs to tackle the problem. The Oxford Martin School, which supports a portfolio of highly interdisciplinary research groups at Oxford University, has a Programme on Collective Responsibility for Infectious Disease. They recently published a paper proposing a tax on animal products produced with antibiotics. Could that possibly work? Here’s another great example of a negative externality. Too often capitalism brushes over these and creates a larger longer term cost by not taking these into account. It’s almost assuredly the case that taxing the use of these types of antibiotics across the broadest base of users (eaters) (thereby minimizing the overall marginal cost), would help to minimize the use of these or at least we’d have the funding for improving the base issue in the future. In some sense, the additional cost of eating organic meat is similar to this type of “tax”, but the money is allocated in a different way. Not covered here are some of the economic problems of developing future antibiotics when our current ones have ceased to function as the result of increased resistance over time. This additional problem is an even bigger worry for the longer term. In some sense, it’s all akin to the cost of smoking and second hand smoke–the present day marginal cost to the smoker of cigarettes and taxes is idiotically low in comparison to the massive future cost of their overall health as well as that of the society surrounding them. Better to put that cost upfront for those who really prefer to smoke so that the actual externalities are taken into account from the start. This excellent story reminds me of a great series of stories that PBS NewsHour did on the general topic earlier this year. If you love this podcast as much as I do, do consider supporting it on Patreon. The author is an agricultural economist with many years of experience in the non-profit advocacy sector, the US Department of Agriculture and as a professor at Tufts University. The author's well-known blog on US food policy provides a forum for discussion and debate of the issues set out in the book.